In this Dark Age when already-withering Individual Liberties are under renewed attack, an offering dedicated to Courageous Truth-Tellers and to Stout-Hearted Men and Women who stand resolute before the Forces of Darkness. A long, long time ago, ages and epochs ago, there lived The Mountain, as if the lord of its realms. It had lived for hundreds and thousands of years. It was particularly huge and hard, reaching five miles into the sky and composed primarily of granite and stone. From the tiniest pebbles to the highest hills, all of The Mountain’s vassals and compeers were very respectful of him – indeed, were a little fearful of him. The miasma of fear was quite at odds with the prettiness of the locale. Carbonate, limestone, and marble deposits near the surface and a scattering of tinted and translucent pebbles lent a lustrous, sometimes shimmering, aspect to the landscape. One day, of all the geologically diverse denizens of that pretty locale, a little stone got into a squabble with The Mountain. This had been nothing but the plain truth. The Mountain did keep stomping on little stones and did keep shoving around the hills. The Mountain was a mean bully. But mean bullies do not take kindly to the truth and The Mountain was no exception. “Why don’t you let us all live in peace, you—” began the little stone, but it got no further. The Mountain had slid right on top of it! The angry Mountain twisted round and round a few times, grinding the little stone into the earth. “That’ll teach the twinkly twerp a thing or two!” he growled to himself. The Mountain was well aware that by twisting and grinding he was eroding himself and losing some of his height but in his vengeful frame of mind he did not care. Deep down under his base, The Mountain felt the little stone emit a faint moan of agony. Just perhaps he was mistaken – the sound may have been a suppressed giggle. Or, perhaps, The Mountain was over-sensitive in his fraught state: for, given his incalculable weight, by now any little stone would surely be pulverized into fine dust. Many an age passed, dotted with numerous earthquakes and hurricanes. The ireful Mountain’s rage did not subside – far from it. He cultivated his resentment of his adversary, ‘insignificant’ and ‘wee’ though he considered the latter to be, and kept fretting. Now and then in mountain time, or, about once a century, The Mountain would convulse and jar himself. It was uncomfortable and injurious to The Mountain himself but he wanted to punish the little stone by squashing it. “I’ll show the glittery pygmy who’s boss!” he would fume. An epoch or two went by as did countless volcanos and tsunamis. Once, The Mountain thought he heard some shrieks of pain from way down below – no doubt it was the little stone, finally regretting his brazenness. But The Mountain was so immensely tall and his head was in the clouds so he could never hear exactly what may be going on down at the levels of the mundane and the earthbound. Just perhaps The Mountain was mistaken – what he heard may have been a few peals of laughter. Or, perhaps, he was imagining things altogether in his obsessive vengeance: for, given the horrendous punishment The Mountain had meted out, by now any little stone surely would have been crushed out of existence. More ages, more epochs, and many an earthquake, hurricane, volcano, and tsunami later, came the era of (so-called) Civilized Man. Humans had long been farming and growing crops, they had built many walled cities, they had established renowned lycea, they had recently navigated the vast oceans, and now they were crossing both oceans and continents by flying through the air! On a blustery spring afternoon, an aeroplane flew quite low over a vast scrubby plain, so low that a few passengers could even see two little figures down on the plain, apparently a man and a boy. “What could those two be doing out there?” a passenger asked her husband. Actually, ‘those two’ happened to be a father and a son and what they were doing was taking a day hike. The bespectacled man, of average height and sinewy build, was carrying a small backpack. The brown-haired, slim boy beside him looked like an energetic twelve-year-old. Presently, the father decided to proceed with his plan to show his son how to build a campfire on a windy day and heat some beans. He sent the boy to scour the nearby area for brushwood and scrub while he started to scoop out a circular pit for the campfire and look for suitable rocks to ring it with. The father had dug no more than half the campfire pit when his son came running back, quite excited, and without any brushwood or scrub. “Dad, dad, see what I’ve found!” he yelled. The boy was holding something, which he handed to his father. “What a twinkly, glittery little stone.” He had a feeling that he had made a real find. The father took the ‘stone’ and what he saw rendered him speechless for a few seconds. “I’ll be— this is incredible!” exclaimed the father upon recovering his composure. “Yes, though it’s small, for a diamond it’s huge!” Father and son fascinatedly inspected the precious stone all round and over, admiring it with ‘oohs’ and ‘aahs.’ After a couple of minutes the father carefully put the diamond in his jacket’s inner pocket and zipped it shut. “Some ways over there— it was sticking out beneath a little mound,” the boy replied, pointing back to where he had been. The boy started to jog in the direction he had indicated and his father began to trot beside him. “The mound was a wee little thing, only about this big,” he said, raising his arms and holding his hands apart about six inches from one another. Father and son jogged along, the gusting wind making their mufflers flap and flutter like pennants. In less than a minute the boy spoke. “That mound,” he said, pointing. But both father and son saw that the object pointed to was only a little hump no more than three inches. Just then a hard gust of wind scattered what had been left of the disintegrating little mound. “Oh! There goes the last of it,” said the boy. 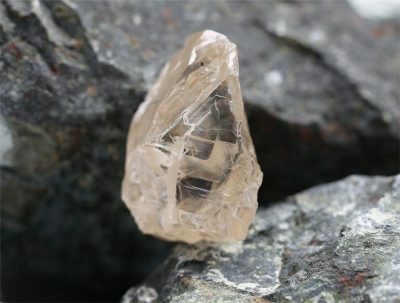 As the boy held the uncut diamond in his fingers, its sharp edges and grooves made a whistling sound in the blowing wind, the note and pitch varying as the boy turned the stone this way and that. Intrigued, he put the diamond to his ear. In a moment or two he glanced at his father, a quizzical expression on his face. He opened his mouth as if to say something but then just shook his head. “What? What?” asked the father, curiosity piqued.